Now let's take a look how to create outstanding and beautifully designed form elements from scratch ourselves. Things can get tricky even if you are experienced designer. It's hard to attract visitors attention, but this article should help to stand out and create semantically correct, good looking and accessible web forms, checkboxes, radio buttons, buttons, fieldsets – everything you can think of when you are creating contact or login page! This tutorial explains how to design a good form using a clean CSS design with only label and input tags to simulate an HTML table structure. 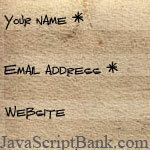 You can use all CSS/HTML elements to design your custom form for your web projects. Very well explained tutorial showing crucial points you should give attention to. Forms don't have to be ugly and boring, and certainly don't have to be inside tables to look nice and aligned. This tutorial will teach you how to make a stunning comment form using an old postcard photo. The example you are going to see is something that you use every day: blog comment form. Ever wanted to match the look of your HTML forms with the rest of your website? This CSS tutorial demonstrates how to apply customized backgrounds to HTML forms, while preserving stucturally clean markup and accesibility. Semantically correct web forms with fieldsets, legends, labels and some CSS styling. It's been tested in FF1.x, IE6 and Opera8. (looks a little quirky in IE5.x but still usable).